Pro inflammatory cytokine, IL-17 (IL-17A or CTLA-8) produced primarily by unique lineage of CD4 T cells that pay a critical central role in the pathogenesis of multiple autoimmune diseases. The IL17, like other cytokines is produce by activation of T cell receptor through CD3 cross linking (4). IL-17 is a crucial effector cytokine, whose production is specifically triggered by IL-23, and it has been shown to be an essential inflammatory mediator in other autoimmune diseases and inflammatory conditions. In human the co-stimulation of T cells thru CD28 several co-stimulatory molecules (ICOS, 4-1BB, CD40L) mildly enhance the IL17 expression where as IL23 profoundly enhance the CD3 induced IL17 expression. The IL-17 expression is also sensitive to cyclosporin-A and MAPK inhibitors, suggesting the involvement of the calcineurin/NFAT and MAPK signaling pathway. IL17 signaling requires its binding to IL17 receptor, IL17 receptor is expression is widespread, the activity of IL17 is most commonly defined by its ability to induce the expression of inflammatory cytokines, chemokines and other mediators by stromal cells. IL17R is also involvement in allograft rejection and Intragraft IL-17 inhibition may be useful as an adjuvant therapy to systemic immuno-suppression in tissue transplantation (1). IL-17RA is a ubiquitously expressed receptor that is essential for IL-17 biologic activity. The activity of IL-17 is most classically defined by its ability to induce the expression of inflammatory cytokines, chemokines, and other mediators by stromal cells. The lack of IL-17 responsiveness in mouse stromal cells genetically deficient in IL-17RA is poorly complemented by human IL-17RA, suggesting the presence of an obligate ancillary component of IL17RC. 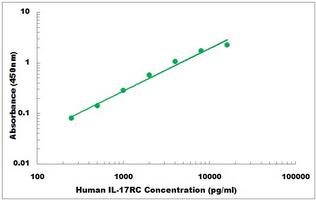 The biologic activity of IL-17 is dependent on a complex composed of IL-17RA and IL-17RC. The IL17RC protein is expressed in prostate tissues and the expression changes with advance cancers due to extensive alternate splicing. 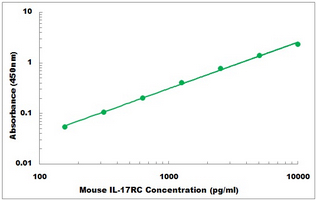 The biological activity of IL17 is dependent on the complex composed of IL17RA ad IL17RC (2). The predominant form of IL17RC is IL17RC1. The predicted IL17RC receptors are membrane glycoprotein that specifically binds to IL17B and IL17E but not to IL17 or IL17C. The IL17RC receptor is known to activate the NF-KappaB and the production of IL8 induced by IL17E. The rat homologue of this receptor is induced during intestinal inflammation, suggesting the immunoregulatory function of this receptor. The IL17RC is expressed multiple distinct variants forms (IL17RC1-C11), like other cytokines receptors, IL17RC also has multimeric structure. The IL17RC has at least 2 TMD that anchor the protein to the cell membrane with a large intrcyctoplasmic domain where protein and signaling molecules interact with the receptor complex (3). Western Blot analysis of IL17RC expression in transfected 293T cell line (H00084818-T01) by IL17RC MaxPab polyclonal antibody.Lane 1: IL17RC transfected lysate(59.18 KDa).Lane 2: Non-transfected lysate. 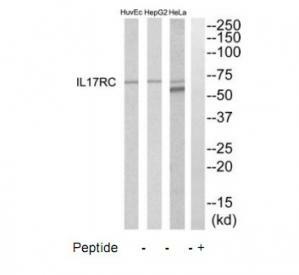 Western blot analysis of IL-17RC expression in HeLa (A); U251MG (B) whole cell lysates. Western blot analysis of extracts from HeLa, HepG2 and HuvEc cells, using IL17RC antibody.The lane on the right is treated with the synthesized peptide.